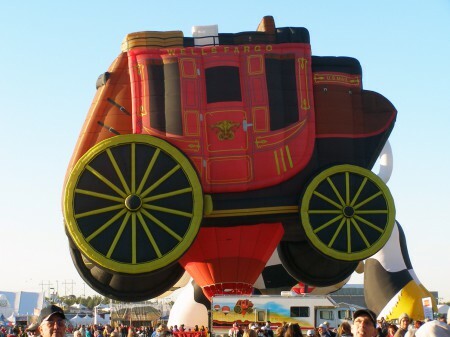 The photographs of the Albuquerque Balloon Fiesta portion in this post were taken by two of my lifelong friends, Mike and Jane McLaughlin. We grew up in Dorchester, one of Boston’s largest neighborhoods. 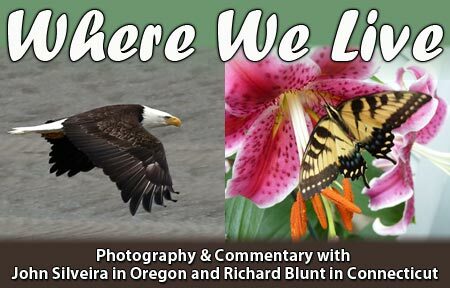 After successfully raising two children and managing rewarding professional careers, these two exceptional folks are now retired and are engaging in one of their lifelong passions — world travel. 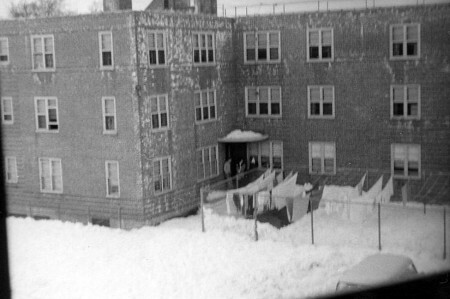 We grew up in a housing project in one of Boston’s largest neighborhoods in the 1950s and 1960s. It was a great place to live, especially for folks with young children. The stark-looking red brick buildings in this development were furnished, well built, safe and comfortable homes to about 400 families. Most of these families had a parent that was a member of the military during the Second World War. Friendships were easily made in this diverse area, and many of these friendships are still alive and doing well today. Some of the housing projects that were built in Boston during the 1950s were built in areas that made them seem more like prisons than housing development. This development was built in an attractive residential neighborhood that was surrounded by an expansive open park and wilderness-like playground. Most of its attractions were in easy walking distance for an average 8 to 10 year old. If transportation was necessary, safe and reliable public transportation was always available. Below are a some photos of our old neighborhood. The first three were taken with a Kodak Brownie 127 camera that Santa Claus left under my Christmas tree about 60 years ago. This is where we called home. 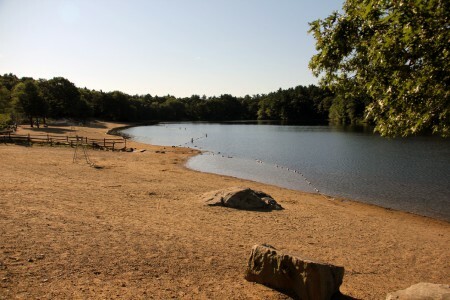 Below is Scarboro Pond. 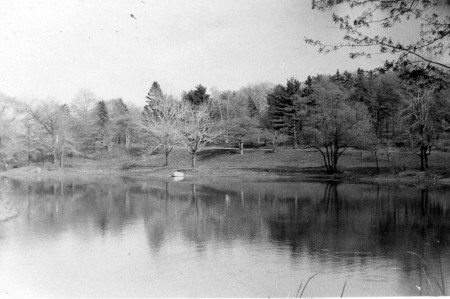 It was created along with two other ponds as part of Frederick Law Olmsted’s master plan for Franklin Park, the largest park of the Emerald Necklace. This pond is surrounded by 500 acres of open and wooded land, and is an easy half hour walk from Franklin Field. Here we enjoyed fishing, hiking, and picking wild blueberries in the spring and summer. During the winter, the many hills of the golf course and the wooded areas were great for coasting (snow sledding). All of this was free. Below is Franklin Field, our most frequented playground. 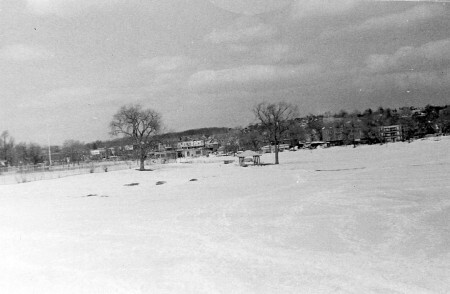 Because our neighborhood was so ethnically diverse, we were exposed to a worldwide variety of sports activities on this still active open field, including ice skating (in the cold months the Boston Fire Department flooded large portions of the field), baseball, tennis, softball, basketball, bocce ball and cricket. We were never able to fully understand cricket, but these games were fun to watch. We also had fun trying to mimic the unique accents of the British, Haitian, Trinidadian and Jamaican players as they bantered with each other during the game. We were also amused by the retired men, who constantly argued while rolling a huge ball down a narrow dirt strip. Like cricket, we never quite understood bocce ball. 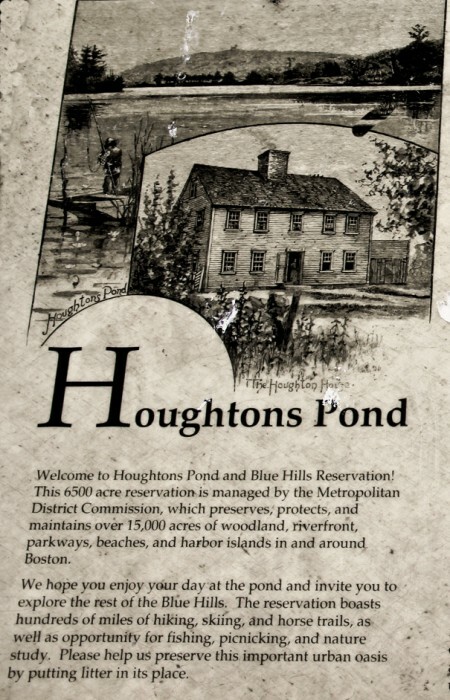 Houghton’s Pond is a spring-fed kettle pond located within the Blue Hills Reservation in Milton, Mass. This, by far, was our largest and most challenging play area. The 15,000 acres of wilderness-like woodlands that surrounded this popular swimming area was, to us, like being in the wilds of Maine or Alaska. During one warm and sunny day during February school vacation, a group of us (which I think included me, Mike, his brother Ed, Bobby, Buddy and Kenny) loaded a bunch of crude camping stuff into a Radio Flyer wagon and headed for the Blue Hills. The walk was a little longer, but still manageable. Well, everything went great until the sun went down when radiation cooling gripped the area at the high elevation. I don’t think that details of the kind of night we weathered is necessary. You would think that this experience would teach us a lesson on winter camping, but we repeated this adventure the following year with better equipment and a slightly, I repeat, slightly, better outcome. 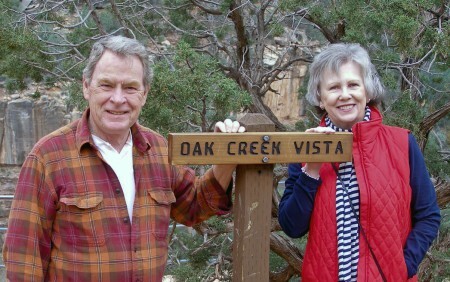 When adventures like this come to mind, I can understand why Mike and Jane look forward to their next travel adventure. These adventures are much wider in scope, but the anticipation and excitement is the same. Don’t tell Mike that I said this, but I think the February thing was his idea. This is only a sampling of the rich and rewarding environment that this neighborhood offered its residents during the 1950s and 1960s. Boredom and inactivity were nonexistent at Franklin Field during this time. 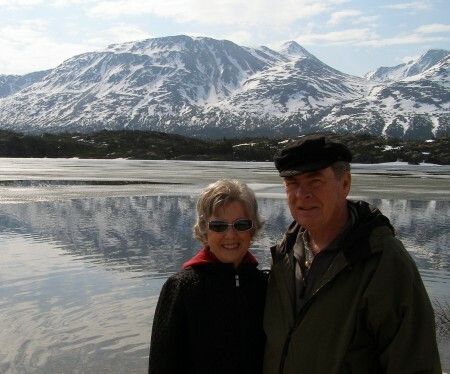 Mike and Jane in Alaska with Mt. McKinley (the high one) in the background. I love this photo, because it reminds me of my own cross country motorcycle trips during the 70s. A favorite author of mine states in his work; it is time to “bring on the bear,” Which in this case is the main subject of this post. Mike and Jane were visiting friends in Arizona. Their next destination was the balloon festival in New Mexico so they headed down Arizona State Route 89A, just south of Flagstaff into Oak Creek Canyon, a smaller cousin to the Grand Canyon, to Oak Creek Vista, an overlook with a spectacular view of the canyon. This canyon is known around the world for its spectacular scenery with colorful rocks and unique formations. May the winds welcome you with softness. May the sun bless you with its warm hands. May you fly so high and so well that God joins you in laughter and sets you gently back into the loving arms of Mother Earth. The first Spanish settlers arrived in New Mexico around 1540 headed by General Francisco Coronado. In 1706, King Phillip of Spain granted a group of later settlers permission to build a new city on the banks of the Rio Grande. These colonists chose a spot at the foot of the mountains where the river made a wide curve. This spot provided them with abundant water and plenty of hard wood for construction and fuel. They named the new settlement La Villa De Alburquerque after a prominent Spanish duke. Over the years the first “r” was dropped, leaving Albuquerque spelled as it is today. Being religious people, the first thing they built was a small adobe chapel, which later collapsed in 1792, but was rebuilt in 1793 and named San Felipe de Neri. This adobe chapel was built in a section of Albuquerque called Old Town, a popular shopping and tourist destination which consists of about 10 blocks of historic adobe buildings grouped around a central plaza (a common feature of Spanish Colonial towns). 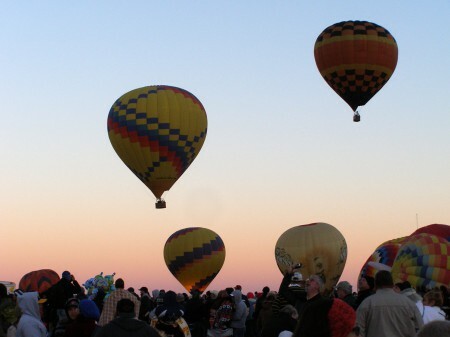 Today, Albuquerque is a major city with a diverse population, with its cultural traditions being part of everyday life. 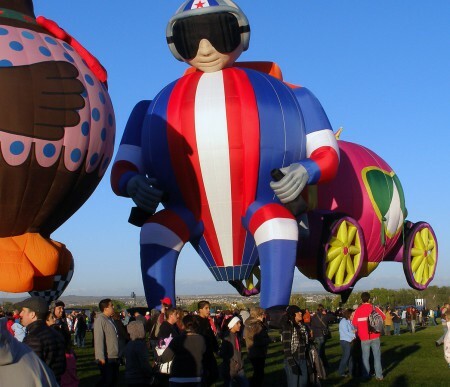 The Balloon Fiesta is still an infant when compared with this rich history. But I am sure that it will continue to be a popular event well into the future. 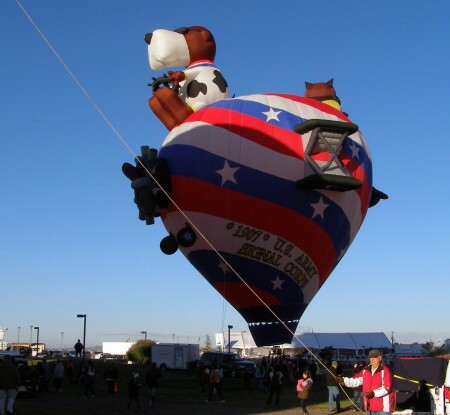 The Balloon Fiesta began in 1972 to highlight the 50th anniversary celebration of a local radio station. 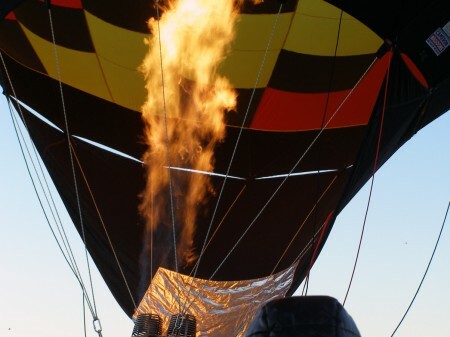 The radio station manager asked the owner of Cutter Flying Service, and the first owner of a hot air balloon in New Mexico, Sid Cutter, if he could use his balloon as part of the festivities. Twenty one other balloonists were invited to attend the celebration in an attempt to break the world record of 19 balloons assembled in a rally. Unfortunately, bad weather prevented several from attending. 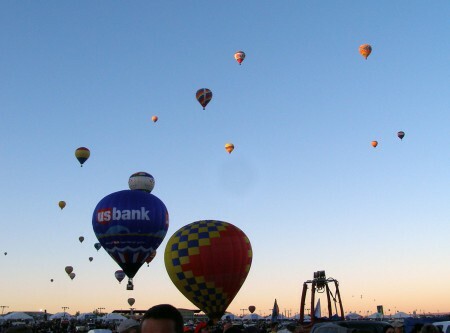 So, the first Albuquerque Balloon Fiesta began with only 13 intrepid balloonists. 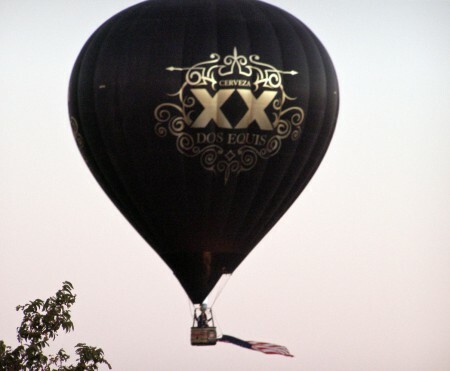 Today, it is the world’s largest hot air ballooning event. 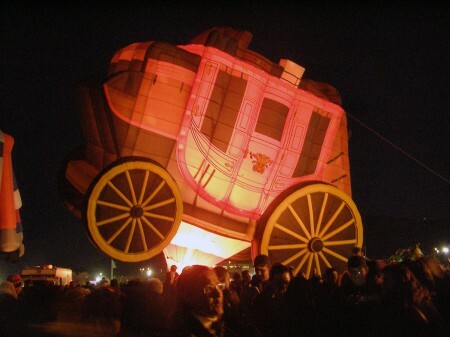 For nine days during the first week of October, balloons begin their assent over the city just before dawn breaks. 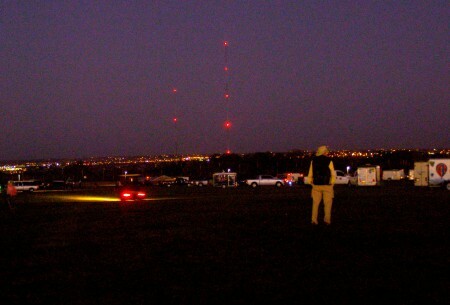 This is the Dawn Patrol; it serves to give other balloonists information about wind speeds and direction at different altitudes. 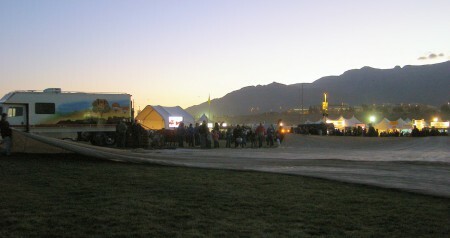 The Dawn Patrol is followed by the National Anthem, and the first Mass Ascension of the day. This is one of the most spectacular events of the fiesta. All of the participating balloons are launched in waves, coordinated by launch directors. The sight of several hundred balloons in the sky is a breathtaking sight for both first-time visitors and veterans. Another popular event is the Special Shapes Rodeo. 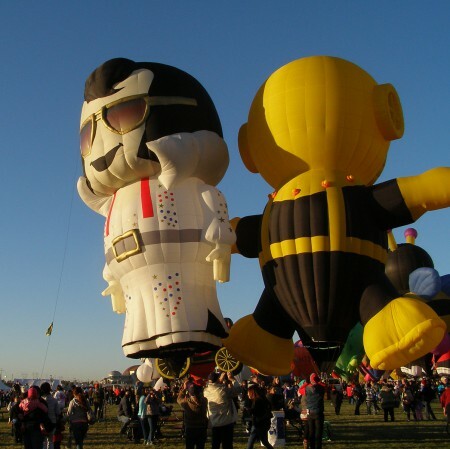 Many non-traditional uniquely shaped balloons are launched at the same time. 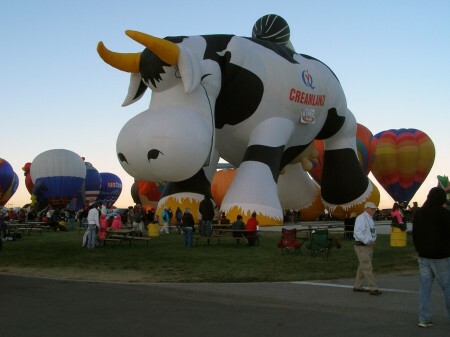 Photos of two of the most famous shapes, the milk cow and the stagecoach, are shown below along with other innovative balloons. 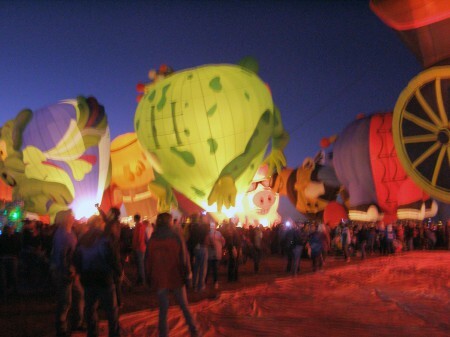 These balloons are also featured in the Glowdeo, a nighttime event that features all the special shapes balloons illuminated by their propane burners, standing static without taking off. 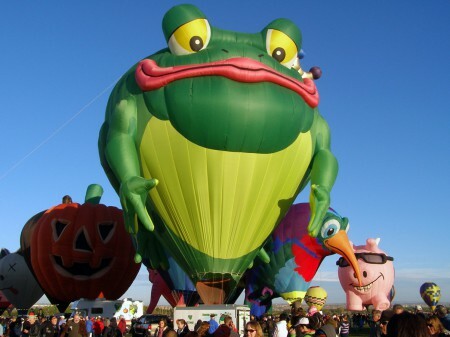 Other events include: The Fiesta Challenge, where balloonists attempt to drop a marker closest to a target. The Challenge Gas Balloon Race, where special long-distance gas-filled balloons are inflated and launched. 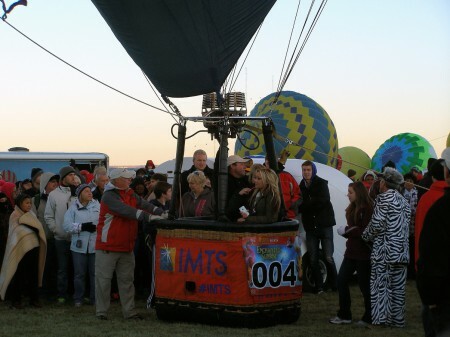 The winner of this contest is the balloon that travels the farthest. 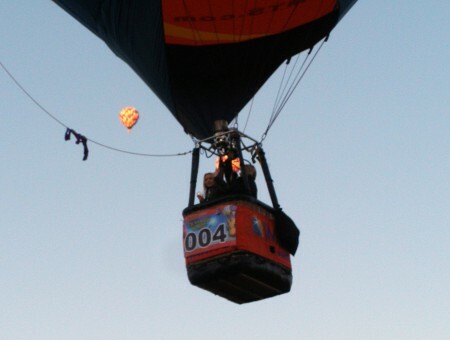 Balloons competing in this race have traveled as far as the East Coast. Nearly 750,000 visitors attend this event every year. If you would like to join the fun and experience a vacation to remember, this year’s Fiesta will be held October 4th thru the 12th. I am planning to be there with my wife, Tricia, and Ginny Lee (my camera). I hope to see you at the Fiesta this year! This entry was posted on Tuesday, February 4th, 2014 at 1:00 pm	and is filed under Grand Celebrations. You can follow any responses to this entry through the RSS 2.0 feed. Both comments and pings are currently closed.